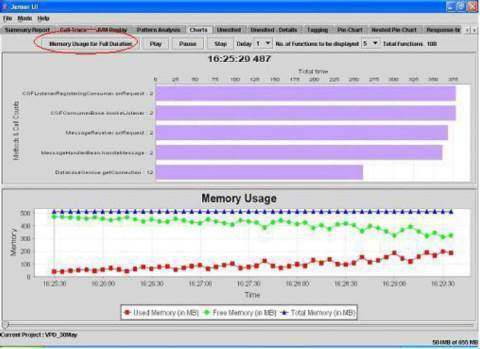 Allmon is a generic system collecting and storing metrics used for performance and availability monitoring. CallGraph is a view plugin for Eclipse that enables graphical exploration of call and class hierarchies. Leverages the internal platform Call Hierarchy and Search mechanisms and uses Zest to provide a searchable graphical representation of the caller/callee relations between methods (including constructors and internal classes) and sub/super-class relations between classes. Designed to help understand complex call and class relations in larger scale applications. Checkstyle is a development tool to help programmers write Java code that adheres to a coding standard. It automates the process of checking Java code to spare humans of this boring (but important) task. This makes it ideal for projects that want to enforce a coding standard. Checkstyle is highly configurable and can be made to support almost any coding standard. The program ckjm calculates Chidamber and Kemerer object-oriented metrics by processing the bytecode of compiled Java files. Jensor is a light-weight, low-overhead Java profiler written entirely in Java. Jensor is built on ByteCode Instrumentation (BCI) technology. Jensor provides innovative analysis techniques that help to detect and eliminate bottlenecks in Java applications. From a functionality perspective Jensor captures data from running applications and provides offline analysis. It also has the capability to start and stop profiling from Jensor Analysis WorkBench (JAW). JAW is a Java swing-based client and provides GUI for analyzing data captured by Jensor. Jensor also provides rudimentary Security mechanisms by allowing only authorized users to start / stop and view profiling data. JRipples helps programmers during software change. JRipples is based on the philosophy of "intelligent assistance", which requires close cooperation between the programmer and the tool. The tool analyzes the program, keeps track of the inconsistencies, and automatically marks the components to be visited by the programmer. The Software Duplication Detector (SolidSDD) is a standalone application for detecting and managing source code duplication (i.e., code clones) in software. It can be used to analyze large projects and detect code that has been cloned (e.g., via cut-n-paste operations) during development. The currently supported programming languages are C, C++, C# and Java. In addition to identifying the code clone fragments, SolidSDD offers an intuitive graphical interface for assessing the code duplication characteristics and the location of the duplicated fragments in the code stack. This interface enables developers, architects and software managers to better manage the process of refactoring by assessing the required effort and establishing refactoring priorities. Soot is a Java optimization framework. It provides four intermediate representations for analyzing and transforming Java bytecode. Soot can be used as a stand alone tool to optimize or inspect class files, as well as a framework to develop optimizations or transformations on Java bytecode. Squale is a qualimetry platform that allows to analyze multi-language software applications in order to give a sharp and comprehensive picture of their quality. Tattletale is a tool that can help you get an overview of the project you are working on or a product that you depend on. UCDetector (Unnecessary Code Detector - pronounced "You See Detector") is a eclipse PlugIn tool to find unnecessary (dead) public java code. For example public classes, methods or fields which have no references. UCDetector creates markers for the following problems, which appear in the eclipse problem view. The goal of Usus is to provide Eclipse Plug-Ins that help to integrate common compiler and formatter settings in the Eclipse workspace, support Checkstyle, EclEmma and other tools, and apply some OO design metrics to analyse weak spots in the code.